I bet you have trouble sleeping at night. I mean, you are here reading our Best White Noise Machine guide after all. But since you are here, I can also tell that you’re ready to do something about those sleepless nights. Getting a poor night’s sleep can leave you feeling exhausted, stressed out, and unable to concentrate… and for most people, this simply isn’t a long-term option. Short on time and simply ready for some shut-eye? Our top pick for getting a complete and restful nights’ sleep is the Ecotone Sound + Sleep Machine. Among those who report having trouble falling – or staying – asleep, inconsistent noises are one of the most commonly given reasons. While obvious sounds like traffic and snoring can cause trouble sleeping, people with sensitive ears may not even consciously notice these minor distractions at all – but their subconscious definitely does. If noises are keeping you awake at night, a white noise generator may just provide the sleep solution you’re so desperately after. The best white noise machine can fill your room with the sounds of crashing waves, chirping crickets, or even a beating heart; all you need to do is push a button. And then you can just lay back and be serenaded by relaxing nature tracks or peaceful frequencies of white noise which covers up unpleasant, inconsistent sounds altogether. Best White Noise Machine 2018? Since there are so many different sound machines out there for sale, each with their own features and functions, it can be difficult for the average person – someone who has little to no experience with these units – to separate the quality buys from the rip-offs. So on that note, here is out expertly crafted list of the best white noise machines that are currently on the market. The Ecotone Sound + Sleep Machine has consistently been rated as one of the top sleep machines for a number of years now. That’s because it has several industry-leading features which make it stand out as the best white noise machine from other units on the market. One of Ecotone’s best features is its assortment of natural sounds that are proven effective at helping people calm down and become relaxed when it’s time for sleep. This white noise generator works well to block external sounds which you sleep, allowing for a full night’s rest every time. Reacts to the Environment – The Sound + Sleep is the only model with adaptive technology in it which can easily adjust to match background noise levels for uninterrupted relaxation. The adaptive sound technology responds to the outside noises and adjusts itself according to the volume without becoming a distraction itself. Natural Sounds for Relaxation – There are nearly a dozen different sound profiles present in the Ecotones Sound + Sleep Machine. These work to promote deeper sleep and give a greater sense of relaxation and renewal. One feature which makes this product quite unique is that it naturally mixes together its high-definition sounds, preventing them from becoming repetitive. 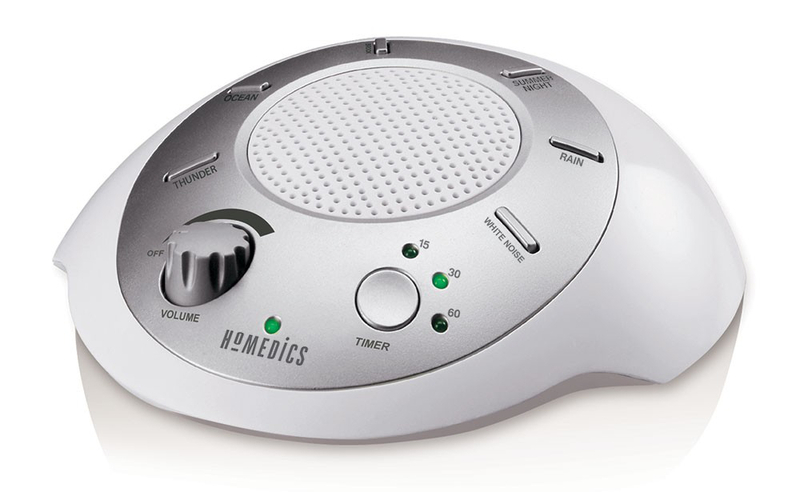 Easy Operation – Using this white noise machine is quite easy; all you have to do is flip the switch on and off. There is also a sleep timer that’s fully adjustable in 30 seconds increments. This gives you the option of either running the unit all night, or having it turn off once you drift away to sleep. The all-night continuous option gives you a lasting soothing effect and the humming white noise sound remains consistent until you get up in the morning. There are some drawbacks of this model, however, which definitely need to be mentioned here. One negative is that it looks like an alarm clock, but doesn’t have a time display or alarm feature to wake you up in the morning. The system also doesn’t utilize a battery backup, so it needs to be plugged directly into the wall at all times. There also aren’t any ports for ear phones. Despite its drawbacks, many experts recommend this sound machine to the consumers because of its great blend of effectiveness and value. The Ecotones Sound + Sleep Machine is priced competitively against other units in its class, but delivers far better quality in a number of categories. The Homedics Sound Spa Portable Sound Machine is so compact and convenient that you can take it with you anywhere you go. Its small size also allows it to be placed on the average nightstand without taking up much room. The Sound Spa Portable has a powered AC adapter, but can also be powered with four AA batteries. You can easily turn the machine off by turning the volume dial to 0, and the built-in timer can be set for 15, 30 or 60 minutes shut-off intervals. The Homedics Sound Spa Portable Sound Machine comes with six different sleep sounds: thunder, ocean, summer night, white noise, rain, and brook. The sound buttons for each track are arranged in a circle the speaker. The thunder loop is only around 21 seconds long, during which you hear two booms of similar length and resonance. One downside of the Sound Spa is that some of the tracks, like the thunder loop, don’t give you much of a feeling of variety. However, the ocean sound is like that of ocean on a windy day. Some swells and crashes leave some time for a few other ocean sounds. There is also a bass track, but you don’t get the deep undertones one might expect. The brook and rain sounds have, more or less, similar characteristics – the brook sound is like heavy rainfall on puddled water, while the rain sound is like steady rain on the street. This white noise machine is quite compact and it’s always travel ready. It’s likely the best white noise machine for on-to-go use. You can easily fit the device in a diaper bag or suitcase. The controls of this machine are quite simple to figure out, and it’s easy to adjust the volume and set the timer. It can be extremely effective at masking outdoor noises like nearby construction, street traffic, or loud neighbors. The Homedics Sound Spa Portable is quite portable and has six different onboard sounds. Its design is simple and quite easy to operate. The overall quality is pretty good, but not high-end. 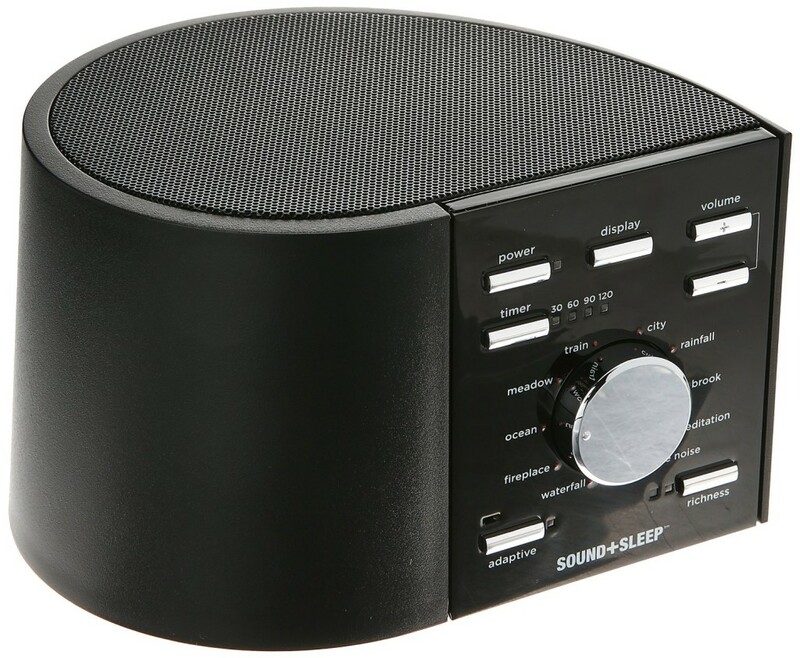 The Sound Spa Portable is, however, fairly inexpensive, so it may just be the best white noise machine for buyers strict budgets. The Dohm White Noise Machine has been around for more than 50 years – you’ve probably already heard of it. It has a distinct circular shape which makes the brand quite easy to recognize. The National Sleep Foundation chose Dohm as their recommended sound machine: all you have to do is turn it on and you will hear soothing and all-natural white noise all night long. The Dohm sleep machine produces a soothing sound of rushing air without the annoyance of a high-powered fan. It has an adjustable housing with a unique asymmetrical shape which produces a calming tone and volume – a completely natural sound. It also blocks a wide range of distracting noises and promotes a deeper sleep and relaxation. Durable and Lightweight – This unit is quite durable; it’s made of a sturdy plastic composite. It is a compact and portable sound machine with a diameter of just 5-3/4 inches, and can easily be placed on your nightstand or any other convenient location. It is also light enough for frequently traveling. 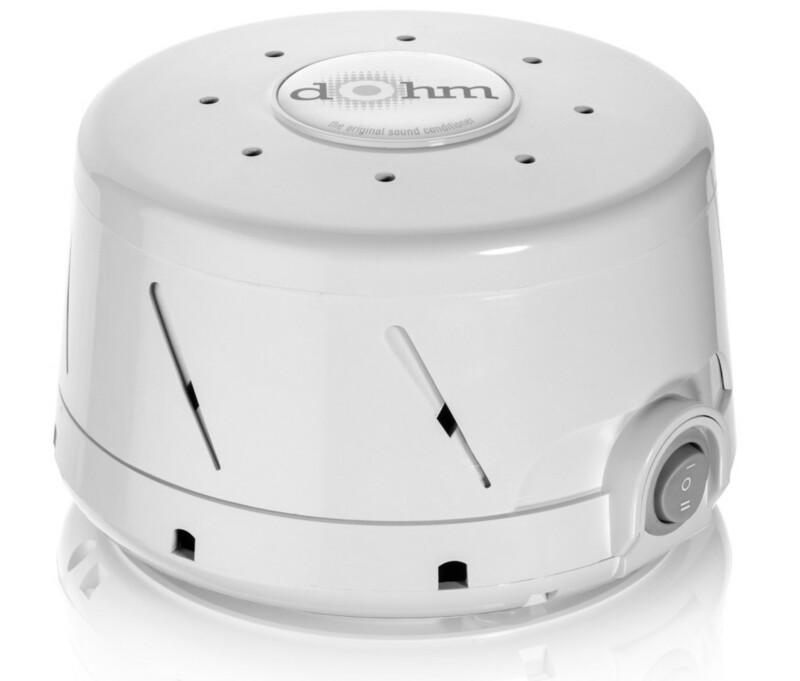 Easy to Use – The Dohm White Noise Machine is quite easy and simple to use. First you choose either the high or low setting with a switch, then you fine-tune it until you get the preferred tone and volume. With all of its benefits, it’s no surprise that the Dohm White Noise Machine is always a strong contender for the title of best white noise machine. The LectroFan White Noise Machine is a widely popular sound machine that has been an industry favorite for the last few years. There are a lot of people who swear by the white noise that this machine generates. It is definitely one of the best white noise machines out there for falling asleep, if not the very best. The device features 10 unique fan sound and 10 non-repeated white noise tones which help get – and keep – you calm and relax. You can take this machine anywhere you go; its small size makes it a perfect fit for traveling. 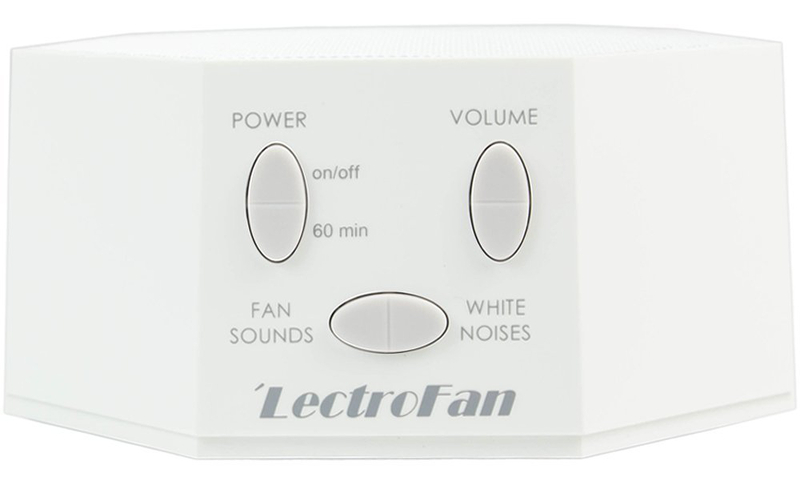 The LectroFan White Noise Machine has a frequency that ranges from 20 to 20,000 Hz. This helps to neutralize all the annoying background noises that are keeping you from sleeping well. The fan sounds are all fairly similar but they produce more of a humming noise rather than a static sound. Having the option between white noise and fan sounds is great for sleepers who enjoy a little bit of variety while trying to get to sleep. The LectroFan also consumes less electricity than many other models in its class. The Graco Sweet Slumber is specifically designed to help children fall and stay asleep. This device is a popular choice to help babies from 0 to 12 months sleep well during both the day and night. It can be difficult for some parents to get their babies to take naps during the day. 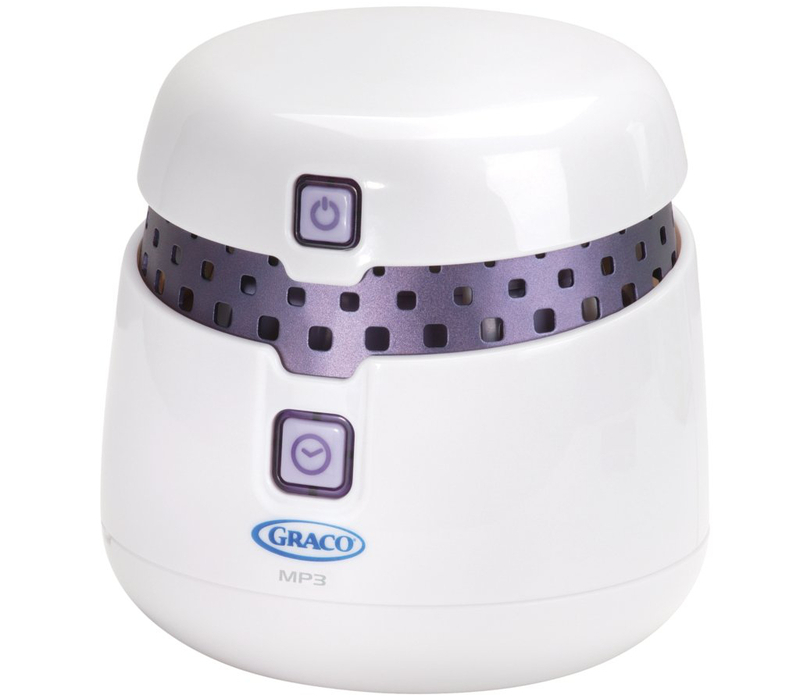 But with the soothing sounds of the Graco Sweet Slumber, many people report longer sleep and fewer interrupted nights. A unique feature of this unit is the presence of an auxiliary cable port. There is a small port, located beneath the baby’s sound machine, which can be connected to your mobile device’s headphone jack. There is also a built-in nightlight feature. When it’s on, a soft blue glow appears between the top of the machine and the base for added comfort and relaxation. All in all, the Graco Sweet Slumber is one of the best white noise machines for babies out there. White noise is a great sleep aid. These machines work by generating a relaxing ambient sound which can block snoring, automobile noise, and other unwanted distractions. This leads to a deeper, higher quality sleep night after night. White noise generators are great for couples where one of the partners snores. They may not stop the storing, but they will provide an ambient background noise that makes it possible for the other partner to ignore the loud breathing. Another place where sound machines are commonly used is in the office. If you spend your days in a hectic business environment, you know exactly how difficult it can be to focus sometimes. With so much going on around you, a white noise generator is the perfect way to concentrate on your work. For parents of young babies, a sleep machine can be a savior when it comes to get a few hours rest. Babies that have a hard time falling asleep during the day may find it much easier with a calming ambient noise in the background. Finally, a great thing about portable white noise machines is that they’re so small and lightweight that you can take them everywhere with you – whether you’re at your home, the office, or in a hotel room. Noise masking is exactly what any pick worth of the title of best white noise machine is supposed to do – provide ambient sounds which mask other, less pleasant noises. When taking a look at a unit’s ability to mask noise, on important characteristic to focus on is its “looping”, or how frequently the sounds on the tracks repeat themselves. For many people, units with short looping times will provide little benefits when it comes to fall asleep, although once they are asleep the tracks will still help prevent other sounds from waking them up. Background noise machines come in all shapes, sizes, and costs. Many of the most expensive units will have high-tech upgrades and impressive sound channel options, but provide little extra value over the more reasonably priced mid-grade alternatives. On the other side of the spectrum, low-end white noise machines often have tracks that are low quality, have short loops, and don’t provide near as good of a quality of rest. Going for a bare-bones model is rarely recommended, simply for the fact that you can get a far superior noise generator for just a few dollars more. Even the best white noise machine isn’t going to cost much more than a low-quality imposter, and the extra investment will quickly be paid back in deeper, more refreshing sleep. If you’re having trouble sleeping at night – especially if your lack of sleep is caused by annoying distractions like a snoring partner, loud neighbors, or constant traffic – you can’t afford to go on without looking into at least one of the best white noise machines mentioned on our list. At Respectable Reviews, we recommend a white noise machine as one of the most effective sleep aids out there. For the price (or less) of going out to eat, you can get much better, higher-quality sleep on a nightly basis. A white noise generator can pay for itself in increased energy and productivity in just a matter of days. So in conclusion, depending on your own individual needs and budget, any of the five units listed in this articles could easily be considered the best white noise machine 2018. From the Dohm White Noise Machine to the Ecotone Sound + Sleep Machine, getting a good night’s sleep no further than just a few relaxing ambient tones away.